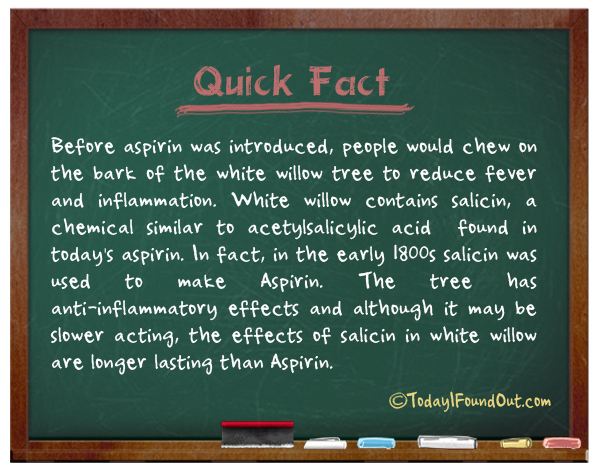 Before aspirin was introduced, people would chew on the bark of the white willow tree to reduce fever and inflammation. White willow contains salicin, a chemical similar to acetylsalicylic acid found in today’s aspirin. In fact, in the early 1800s salicin was used to make Aspirin. The tree has anti-inflammatory effects and although it may be slower acting, the effects of salicin in white willow are longer lasting than Aspirin.